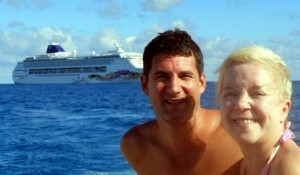 On our last cruise day, we visited Great Stirrup Cay, a tiny private island owned by Norwegian Cruise Lines. It is really scenic. We boarded a tender from the ship to the island to make the 5 minute trip. The weather was gorgeous and the water was unbelievable colors of blue. We landed at a great sandy beach with tons of beach chairs set up waiting for us. There were also vendors, a bbq lunch with all the trimmings, a nice restroom setup and quite a few excursions to take part in. 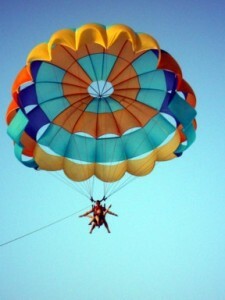 The excursions include Jet-skiing, sailing, water floats and toys, a large water slide and…. 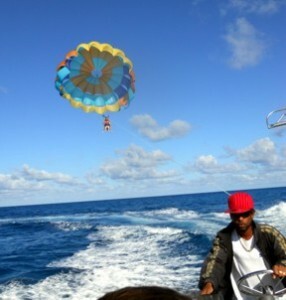 parasailing. Now, for those of you who know me well, you will know that I have a fear of heights. But, Husband wanted to try it and I agreed to go along, so off we go. We were going to do a ‘tandem’ sail so we would be together. We were to first group to take off and we boarded the boat of 2 great Bahamian guys with 2 women and their daughters who were (10 and 12?? maybe) and a single guy. It was awesome. The two girls went first and got harnessed in. 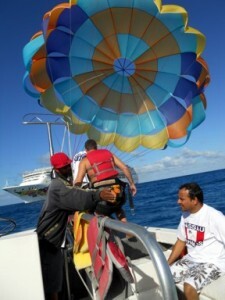 They were taken to the back of the boat to the landing platform. You take off and land from the boat, no messy hanging out in the water. 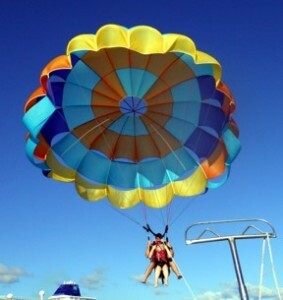 The moms were not going to parasail, but were taking pictures. The girls had a great time. Then it was our turn. One of the moms was kind enough to agree to take pics with our camera, so here are a few. We were lifejacketed, harnassed and strapped in… so we were ready to go! Is it too late to change my mind? Amazingly enough, I survived!! We even got our feet and legs ‘dipped’ into the water on the way back in. Very fun, very free feeling… we had a great time. That’s our cruise ship in the background. We spent the rest of the day relaxing on the beach. 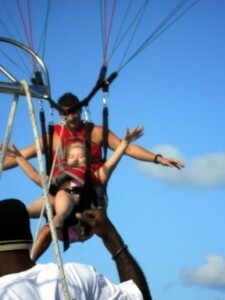 So we had a great time… gosh I’m still so pale! I’ll have to do something about that!